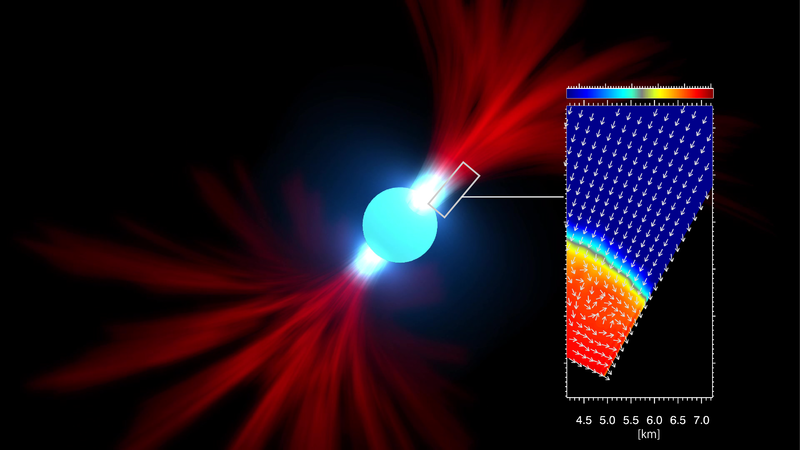 The central energy source of enigmatic pulsating Ultra Luminous X-ray sources (ULX) could be a neutron star according to numerical simulations performed by a research group led by Tomohisa Kawashima at the National Astronomical Observatory of Japan (NAOJ). ULXs are thought to be caused by an object with strong gravity accreting gas from a companion star. As the gas falls towards the object, it collides with other gas. These collisions heat the gas until it gets hot enough to start glowing. The photons (in this case X-rays) emitted by this luminous gas are what astronomers actually observe. But as the photons travel away from the center, they push against the incoming gas, slowing the flow of gas towards the center. This force is called the radiation pressure force. As more gas falls onto the object, it becomes hotter and brighter, but if it becomes too bright the radiation pressure slows the infalling gas so much that it creates a “traffic jam.” This traffic jam limits the rate at which new gas can add additional energy to the system and prevents it from getting any brighter. This luminosity upper limit, at which the radiation pressure balances the gravitational force, is called the Eddington luminosity. 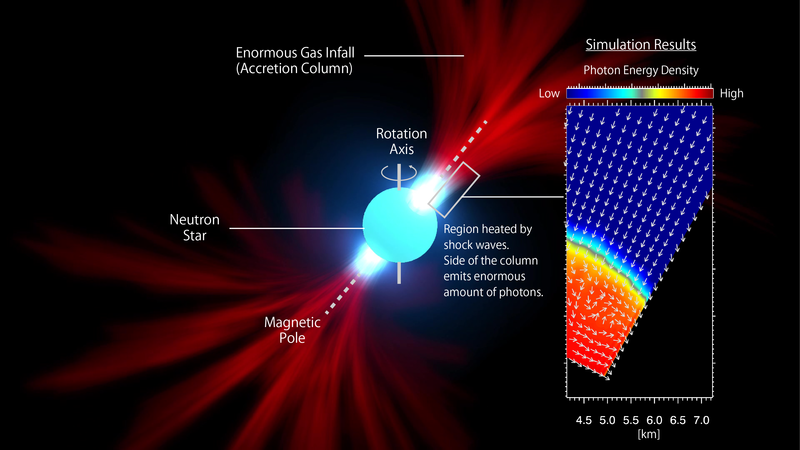 For normal pulsars, researchers use an “accretion columns” model where the infalling gas is guided by the pulsar’s strong magnetic field so that it lands on the magnetic poles. If the magnetic pole is misaligned with the neutron star’s rotation axis (much like how ‘magnetic north’ is different from ‘true north’ on Earth), then the location of the magnetic pole will revolve around the rotation axis as the neutron star spins. If the magnetic pole points towards Earth, it appears bright to us, but when it rotates away, the emissions seem to disappear. This is similar to how a lighthouse seems to blink as the direction of its beam rotates. In order to address the mystery of ULX-pulsar, Kawashima and his team performed simulations to see if there is some way the accretion columns of gas could flow smoothly without a traffic jam and become hundreds of times brighter than the Eddington luminosity. 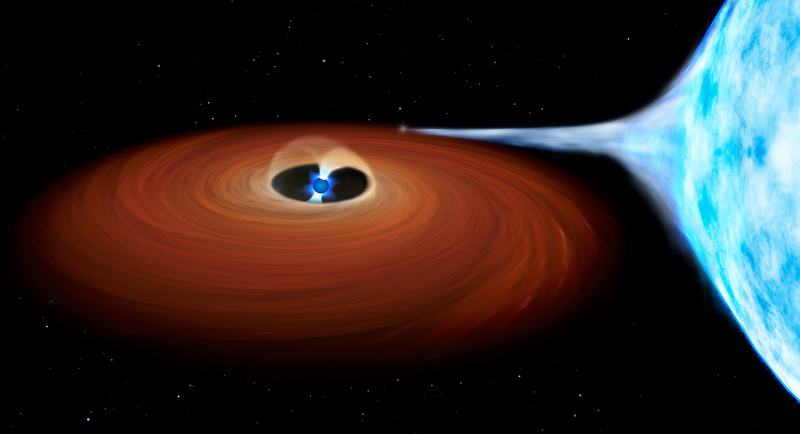 “No one knew if super-critical column accretion could actually be realized on a neutron star,” explains Shin Mineshige at Kyoto University, “It was a tough problem because we needed to simultaneously solve the equations of hydrodynamics and radiative transfer, which required advanced numerical techniques and computational power.” In the 1970’s, a few astrophysicists briefly addressed the calculation of moderately (not extremely) super-critical accretion columns, however they had to make many assumptions to make the calculations workable. “But thanks to recent developments in techniques and computer resources,” says Ken Ohsuga at NAOJ, “we are now at the dawn of the radiation-hydrodynamic simulations era.” The codes are already used for studies focused on black hole simulations. 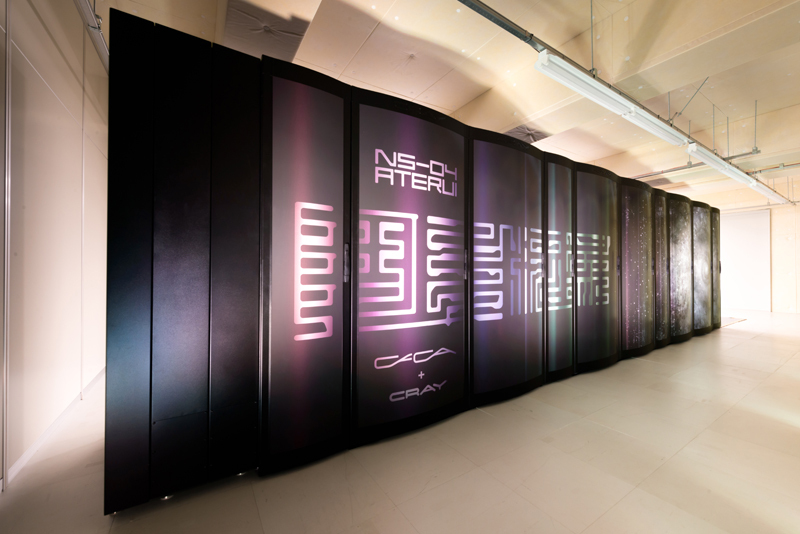 Thus, prompted by the discovery of ULX-pulsar, this team applied their radiation-hydrodynamic code to simulate super-critical accretion columns onto neutron stars, and carried out the simulations on the NAOJ supercomputer "ATERUI." The team found that it actually is possible for the infalling gas to avoid an Eddington luminosity induced traffic jam in super-critical column accretion. In their simulations, the accreting gas forms a shock front near the neutron star. Here, a huge amount of the kinetic energy of the infalling gas is converted to thermal energy. The gas just below the shock surface is rapidly heated by this energy and emits a huge number of photons. But rather than pushing back against the infalling gas as the previous models suggested, the photons are directed out the sides of the column. This means without a traffic jam, more gas can fall in rapidly, be heated by the shock front and produce more photons, so that the process isn’t forced to slow down. The NAOJ team’s model can account for the observed characteristics of ULX-pulsar: a high luminosity and directed beams of photons which will appear to blink as the neutron star rotates. Surprisingly, the direction of the photon beams is at a right angle to the polar beams expected in a standard pulsar model. This is the first simulation to support the idea that the central engine of the ULX-pulsar is a neutron star. This team is planning to further develop their work by using this new lighthouse model to study the detailed observational features of the ULX-pulsar M82 X-2, and to explore other ULX-pulsar candidates. This research was supported in part by the Japan Society for the Promotion of Science through Grants-in-Aid for Scientific Research （No. 26400229, 15K05036）and MEXT SPIRE and JICFuS as a priority issue (Elucidation of the fundamental laws and evolution of the universe) to be tackled by using the Post K Computer. Their paper entitled "A radiation-hydrodynamic model of accretion columns for Ultra-luminous X-ray pulsar" will appear in Publications of the Astronomical Society of Japan on September 8, 2016.